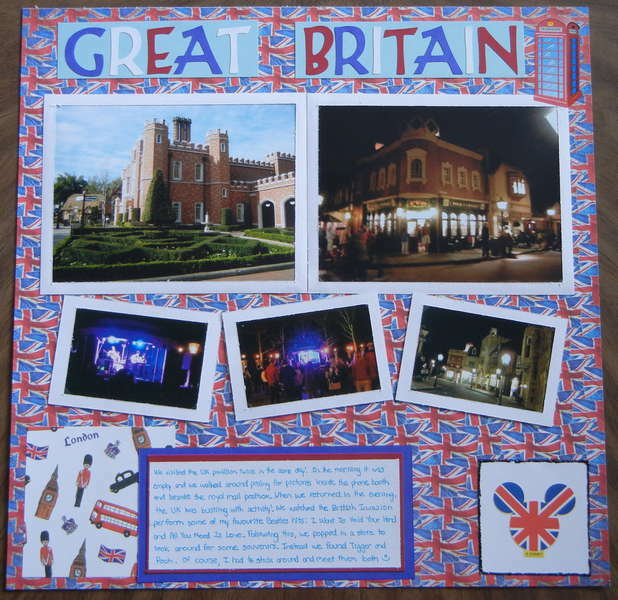 Journaling: "We visited the UK pavilion twice in one day! In the morning it was empty and we walked around posing for pictures inside the phone booth and beside the royal mail postbox. When we returned in the evening, the UK was bustling with activity! We watched the British Invasion perform some of my favourite Beatles hits: I Want To Hold Your Hand and All You Need Is Love. Following this, we popped in a store to look around for some souvenirs. Instead we found Tigger and Pooh, and of course, I had to stick around to meet them both!" The paper I bought a long time ago, so I don't know what brand - it came from SYT. The sticker in the bottom corner is from a set of Disney stickers i bought in the theme park. Great multi photo L/O. I love the back ground paper.